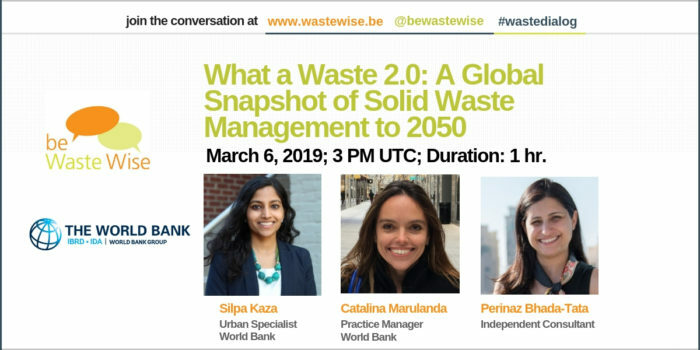 A webinar which launches the World Bank report titled – What a Waste 2.0: A Global Snapshot of Solid Waste Management to 2050. Audience will get to interact with the co-authors of the report. Silpa Kaza is an Urban Development Specialist in the World Bank’s Social, Urban, Rural and Resilience Global Practice where she focuses primarily on solid waste management and low-carbon planning in cities worldwide. 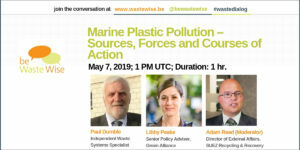 She has worked on waste management in Sub-Saharan Africa, Eastern Europe, Middle East, South Asia, Central Asia, East Asia, and the Latin America and Caribbean region. Silpa developed and managed CURB, a climate action planning tool for cities. Prior to the World Bank, Silpa worked on waste management and environmental issues in the private and social sectors in New York City and India. She also modeled domestic health care policies in preparation for the Affordable Care Act at the National Bureau of Economic Research. Silpa holds degrees in public administration, economics, and mechanical engineering from Harvard’s Kennedy School of Government, London School of Economics and Massachusetts Institute of Technology respectively. Her most recent publications include What a Waste 2.0: A Global Snapshot of Solid Waste Management to 2050, Sustainable Financing and Policy Models for Municipal Composting, and Decision Maker’s Guides for Solid Waste Management Technologies. Catalina Marulanda is originally from Colombia, but she is currently based in Washington DC where she is the Practice Manager of the Urban Development Unit in the South Asia Region. As such she oversees a portfolio of roughly US$5 billion in lending operations under development and implementation in Afghanistan, Bangladesh, Bhutan, India, Nepal, Pakistan, Sri Lanka and The Maldives. This role involves working with national and local governments on urban development, promoting initiatives that aim at making cities more economically productive, environmentally sound, livable and less vulnerable, particularly for the poor. This is done through operations that focus on: (i) financing investments, (ii) providing technical assistance, and (iii) undertaking non-lending analytical and policy advisory work, on areas including municipal management, housing, urban infrastructure, neighborhood upgrading, solid waste management and others. Over the past 14 years at the Bank Catalina has focused on topics related to solid waste management, chemicals management, and brownfield remediation in Latin America, East Asia, South Asia and the Middle East. Catalina has a Bachelors Degree in Civil Engineering from Lehigh University and a Ph.D. in Civil Engineering from the Massachusetts Institute of Technology. Perinaz Bhada-Tata is an independent consultant working on issues related to solid waste management, cities, and climate change. She was previously a Junior Professional Associate in the Urban Development and Resilience Unit at the World Bank. Perinaz received her MS in Earth Resources Engineering and Master of International Affairs degree in Environmental Policy at Columbia University in New York. Perinaz has also worked at NASA-Goddard Institute for Space Studies in New York and Dewey Ballantine. She received her BA from Franklin & Marshall College. She currently lives in Dubai, UAE.